Natalie Su Company is seeking diverse individuals to join our evolving team of company dancers. Applicants should have strong contemporary technique, excellent improvisational skills and be passionate about their own unique style. Capable and eager to develop new work independently and in collaboration. 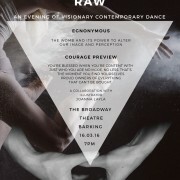 Successful applicants will have the opportunity to perform at The Broadway Theatre as part of the Beyond Boundaries event, participate in a company R&D phase to create a new work in collaboration with Orchestra of London which will be held on the 28th of January, location Saint James Church, Paddington. These initial performances are not currently funded. However, the company does appreciate and value your time and you will receive professional head shots, performance pictures and a short film of each work. The aim is to obtain funding from these performances to tour these and future works. Every Tuesday evening from 5:30 and occasional Saturday morning rehearsal. • A short cover letter explaining why you would like to work with Natalie Su and what you feel you would bring to the company. Please email all submissions to info@nataliesu.com by 15th October 6pm.